"Clocks are appealing on many levels. 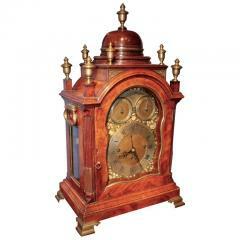 Science and art intertwine to produce precise measurements of time from ornamental cases and dials. Like a painting, we are often fortunate enough to know who made the clock and when. This helps create a strong body of knowledge around the clockmakers and their unique techniques. If there is a clock you are looking for and do not see, please call or email, we may not have cataloged it yet." 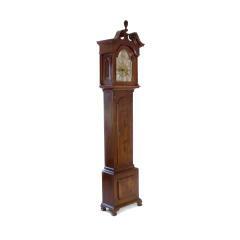 Very unusual mahogany Chippendale musical bracket clock with brass and silvered dial, shaped door with stop fluting corners and circular dome top. Made by William and John Evill of Bath England. 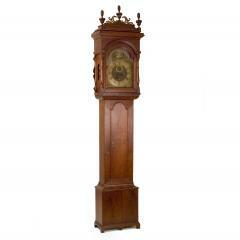 A rare fruit wood musical bracket clock signed by Williamson London. This eight day movement with eight bells does run and plays 4 different tunes. A beautiful gold-gilded banjo clock with an acorn finial, a painted circular clock face with an eight-day movement over an eglomise painted throat with leaf design over a fluted base with an eglomise painting of a leaping horse. A simple and nicely painted case with a bold cornice and a finely painted dial. The works have been removed and replaced with battery opperated works. Only a handful examples exist of architectural built-in elements such as this one. A 30-hour clock placed in the recess of a wall with an applied panel, paint decorated as a tall case clock with the facade of a bonnet with painted dial this clock is an excellent example of painted furniture folk art. 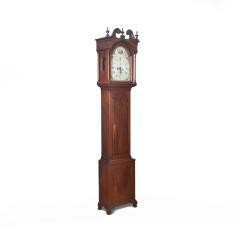 From the unusual Willistown cabinet maker Isaac Thomas, comes a tall case clock with exceptional features. Three flame and turned finials sit upon a sarcophagus top with a pierced fret. The brass 8-day movement is signed “Isaac Thomas, Willistown”. There is a bolection molding under the hood, an arched door, a molded base, bracket feet and a center drop. 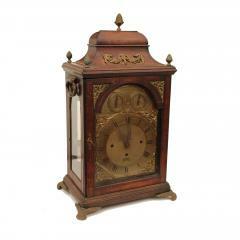 Perhaps the most striking aspect of this clock is the ornate engraving found on the face. A profile of General James Wolfe sits over Moon and stars, a roster, tent encampments and fauna that surround the dial. 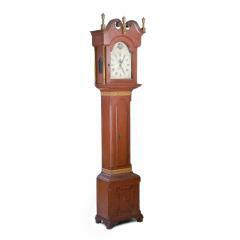 The face is encased in an elegant walnut case with a finial, rosettes, a scalloped panel in the base and ogee feet.